Discussion in 'Star Trek: Voyager' started by Orac, Feb 2, 2019. 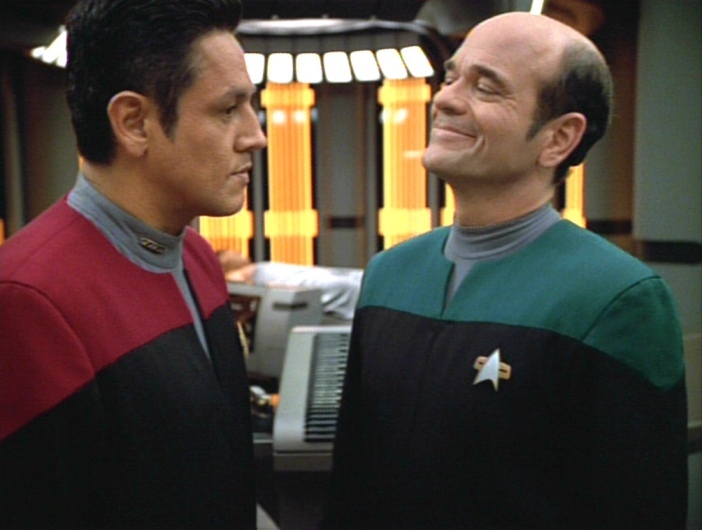 Welcome to the 203rd Star Trek Voyager Caption Contest! Chacotay: "I can't tell if that's your the patient mad a miraculous recovery face or your I farted face." EMH: I'm a doctor, not a tree surgeon. 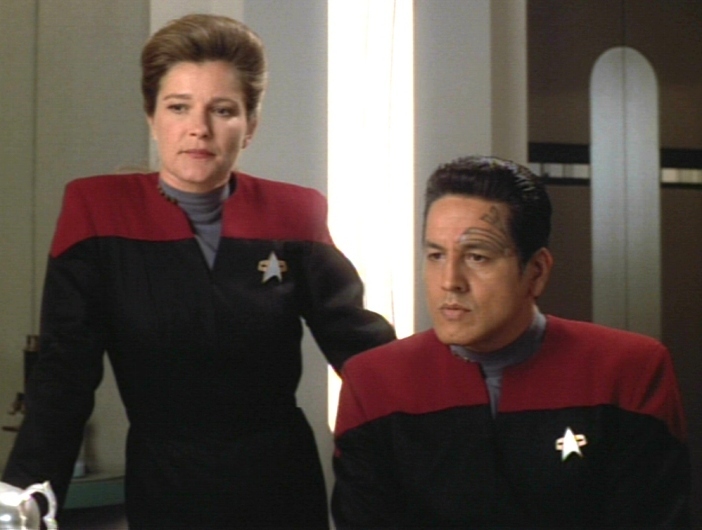 Chakotay: You might want to start changing lanes or you'll miss the exit. 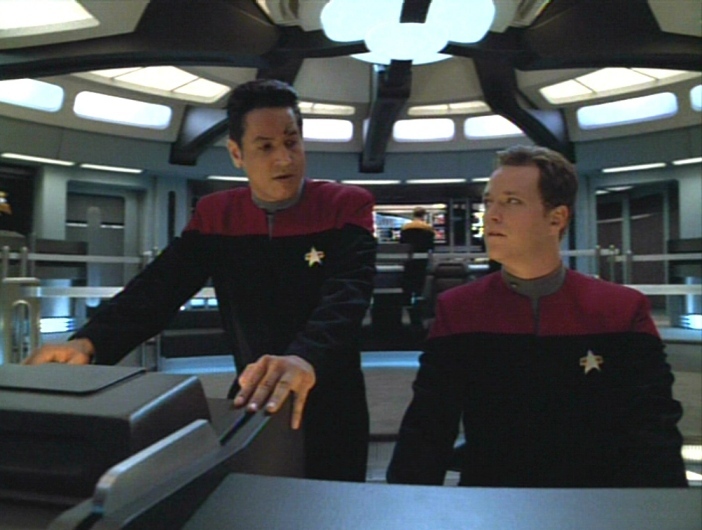 Paris: Stop backseat driving, Chakotay! You wanna drive? Huh? Do you? 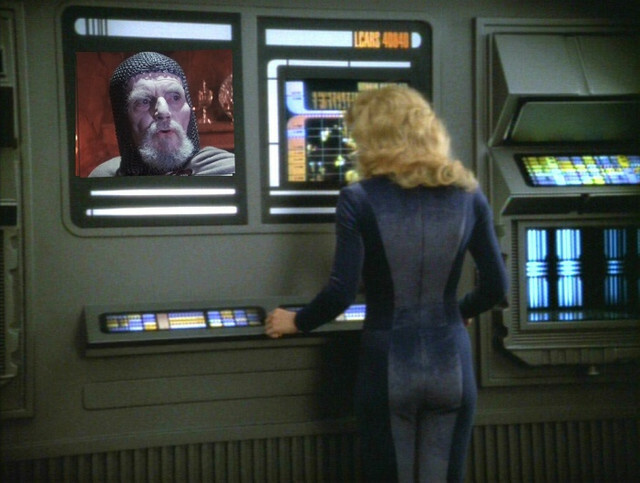 JANEWAY: Look at me! I'm Jean-Luc Picard. "Tea. Earl Grey. Hot." Where in hell's my coffee? Doc Mugatu, TrickyDickie and Cutie McWhiskers like this. TrickyDickie, Captain Kathryn and Orac like this. NARRATOR: Shhh, don't tell her. 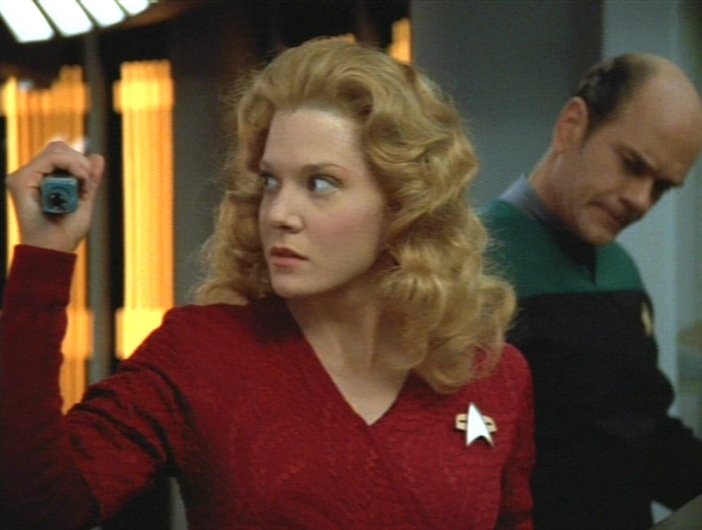 We don't want her to know, but we've replaced Captain Janeway's regular cup of coffee with FOLGERS Crystals. I ... wait what? Crystals? The hell are coffee crystals? ... The 1970's? ... Jesus, you're not gonna let her drink that, are you? ... You realize what crap humans put in their bodies 400 years ago? For godssakes, they SMOKED CIGARETTES!! ... SHE'LL GET CANCER ... or something, I dunno. ... The hell is wrong with you people?! ... Oh thank God you stopped her. Okay okay, fine. Give me the new copy. ... Ahem ... 3,2,1 ... Shhh, don't tell her. We don't want her to know, but we've replaced Captain Janeway's regular cup of coffee with SANKA. ... No caffeine - oh god. Timewalker and TrickyDickie like this. THE DOCTOR: And this... this right here... you see it... the tip of this phallic device. JANEWAY: Yes. I see it. THE DOCTOR: That is exactly where all the fucks I give are. THE DOCTOR: I found this ocular implant design in our database. It belonged to one Colonel Steve Austin. I had no idea the Borg visited the twentieth century. Doc Mugatu and TrickyDickie like this. director: "Cut! Jennifer, what are you doing? No one is being stabbed in this scene. Jennifer? Jeeennnifffeeerrr? Wait, what are you doing? No. No! NNNOOO!!!" STAB! STAB! STAB! STAB! STAB! STAB! STAB! STAB! STAB! STAB! STAB! Kate Mulgrew: "...and then that's when we knew something was wrong with Jenny." TrickyDickie and Captain Kathryn like this. Wow! I am just popping in to say that I did the Voyager contests way back when (2013-2014 I think) and I was the one who passed it to @Catarina and I just saw that she did it for 3 years!!! WOW! That's a long time! Nice to see it is still going. I will have to submit something for this one in a bit! Orac and Ryan Thomas Riddle like this. The Doctor: "You can grip that hypospray any way you please, but it still won't turn into a lightsaber." Kes: "Hey, a girl can dream, can't she?" Doctor: "You can grip that hypospray any way you please, but it still won't turn into a lightsaber." Doctor: "Consider this, you're adored by the Trek fans while the Star Wars fans want Rey dead. 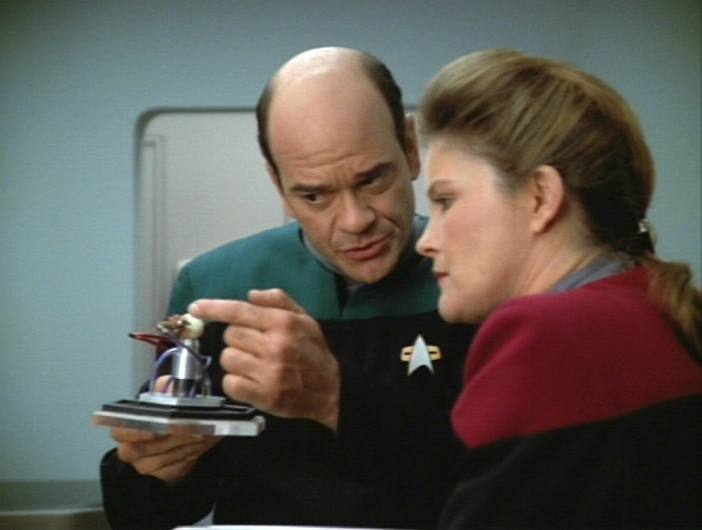 Janeway: "It's very nice, Doctor, but the Annual Voyager Science Fair is for children only." 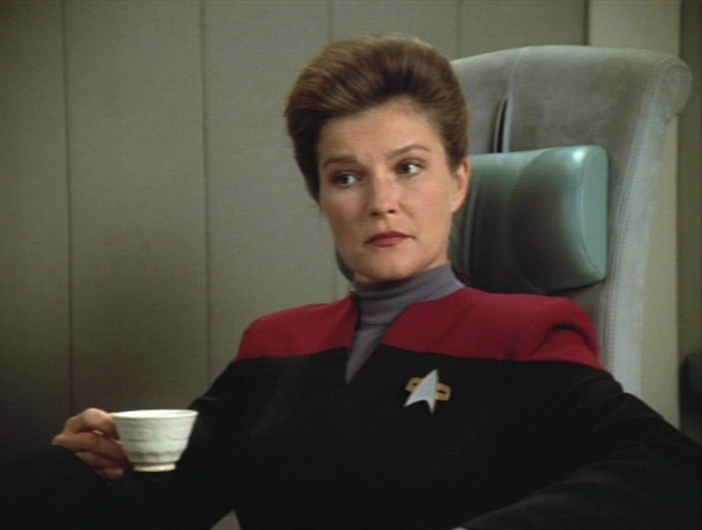 Janeway: No, as a matter of fact I do not extend my pinky when drinking tea. You got a problem with that? KES: Wait a minute. Why does anyone carry knives when you can murder someone just by touching them anywhere with one of these?! 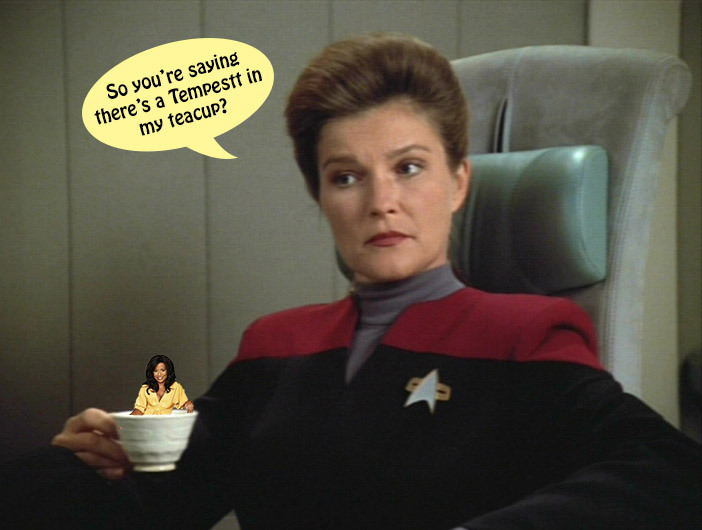 JANEWAY: I ordered coffee, and they gave me this tiny cup. This. Tiny. Cup. Ready phasers. JANEWAY: This is your attempt at abstract art? DOC: What do you think? CHAKOTAY: We're taking a pretty big risk her trying to cross their space. JANEWAY: I'll miss you Kes. But just remember, if you leave now, you're just going to come back in time and try to kill us all having completely forgotten you came back in time to kill us all and failed. Kes (thinking) : If he asks me where the cheese went one more time, I'll kill him! EMH: Where'd th' cheese go? EMH: Now watch what happens when I stroke the cyber-willy thusly. Doc Mugatu, Herbert and Laura Cynthia Chambers like this.